Birthplace: Born in Perth Amboy, N.J. Currently Lives: Rumson, New Jersey, near the beach. But because of Heather's schedules they spend most time in their other house, in California. Wife - Married Heather Locklear December 15, 1994 in Rumson (and December 17, 1994 in Paris)-Divorced in early 2006. Instrument Played: Guitar, Piano, Bass, Drums, Trumpet, Saxophone, Accordion. Education: Woodbridge High School, Class of 1977, Woodbridge New Jersey. Tatoos: Small star tattoo on his right hand, a tattoo on his right upper arm of the SAM-1 guitar with "Who Dares Wins" wrote on it, and a tattoo of a cross and roses and God/Faith on his left arm. Richie has also had Heather's name added to the cross and roses tattoo. Richie knew very early in life that he wanted to be a musician. First he learned to play saxophon, accordion, trumpet and piano. After he heard Eric Clapton for the first time, when he was 12 years old, he started to play the guitar. He said: "Basically, the first time I heard an Eric Clapton record and the fact that he made the guitar talk so that he was communicating without speaking made me want to try it!". Richie started playing in bands 3 years later. The first band he played with was "Rebel", other bands that followed were: Mercy, Duke Williams & The Extremes, The Message, The Next, Hook. Richie's inspirations for his music have been the Beatles, Eric Clapton, Led Zeppelin and Johnny Winter. He joined Bon Jovi in 1983, he saw Jon's act on stage at a concert to promote WAPT's compilation ( where "Runaway" was featured ) and expressed an interest in joining the band: "I said I had a lot of songs and I had a knowledge of making records, and that guitar player (Jon's neighbour and future Skid Row's guitarist Dave Sabo) was very good, but he was very young... The band was kicking and I was the missing piece". The band's debut album was released on Mercury Records one year later. Sambora has co-written four No. 1 hit singles, 20 Top 10 singles and nearly 40 Top 40 singles. In 1991 he dated Cher for a while, a relationship that did not last long but was the first one he had in a very long time. In that same year he released his first solo album, Stranger in This Town, on Jambco Records, a mix of blues and rock that shows his diversity as guitar player and as a composer as well. To make a solo album was a dream of him since he was a little boy. He had to do his own thing, show what he couldn't show in the band. He used about 45 guitars and 25 amps in the studio sessions. He met Heather in early 1994 through a mutual friend and they were married before the end of the year. Their daughter Ava, whom he adores, was born 3 years later. 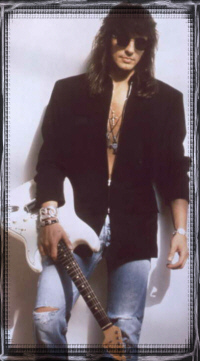 On October 21th, 1996, Richie launched the CD-ROM Richie Sambora Interactive Guitar for those people that wanted to learn how to play the guitar or to know more about his life. Undiscovered Soul, his second solo effort, was released on Mercury in 1998. Recorded in Los Angeles, on the Ocean Way Studios e Chomsky Ranch in the end of 1997, containing 12 songs and produced by the renomed Don Was (Rolling Stones, Bob Dylan, Elton John). Undiscovered Soul shows his qualities as a composer. Beside his steady gig with Bon Jovi, Sambora has collaborated with writer Desmond Child and recorded the title track, "Guitar Man", for Les Paul's album, an unsurpassable honor for a guitarist. Sambora and his music were also featured in promos for Fox-TV's popular Wednesday night line-up during the 1997 February sweeps. In addition, Sambora has composed songs for the movie soundtracks of "Ford Fairlane", "Days of Thunder" and Zalman King's "Red Shoe Diaries."